Since I read both of these Agatha Christie mysteries back-to-back, I figured I'd review them together. Here's what a learned from The Tuesday Club Murders: never turn your back on a Brit, they will put a knife in it. Okay, I know that's not true but you would think it from the characters' experiences in the book. Just about everyone of them had personal knowledge of a murder, not just "hey I read this article" no... no... they had friends and relatives that murdered their spouses or friends. I don't think I want to hang out these people. They are bad mojo. I loved the stories they told. A few times I was close to solving the crime but never quite got all the pieces to fit. It was hilarious how they all would roll their eyes when Miss Marple would say, "This reminds of someone in the village..." and then how they would be shocked when she had it all figured out. Each story had an seemingly insignificant piece of information that would break the case open. I tried to find every time but usually couldn't get it. Agatha Christie was a genius. I also loved the idea of the Tuesday Club, despite the morbid tone of the stories. I guess that's why people play Clue instead, no one is actually murdered for that game. Still, it would be fun to have an evening of this kind of entertainment. 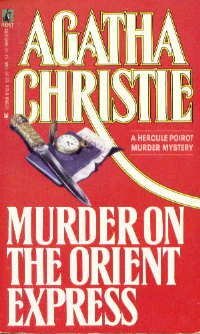 Murder on the Orient Express involves Christie's other favorite detective, Hercule Poirot. Poirot is on his way to London for another case using the famous Orient Express as his transportation. The car he is staying in is filled with a variety of characters: a villainous looking American, a governess, a fussy old lady, a Countess, and several others. When the train gets stuck in a snowbank, it is discovered that the dodgy looking American has been murdered,- stabbed 12 times in his bed!- the train's director begs Poirot to solve the case. One of the main differences between the movie and the book is the moralizing tone the movie takes. It's as if the producers were making clear that people must not take the law into their own hands. The book takes a different view of the crime. I'll let you see that for yourself. Murder on the Orient Express reminded me a lot of And Then There Were None. The similarities being that a number of people are trapped together with no escape, only in the latter case all the characters are murdered. Christie came up with the idea for the book after her train had been stopped due to a flood. I didn't find this book to be as much fun as The Tuesday Murder Club but I did enjoy it. I wish I had read it before watching the movie though. I have NEVER read a book by Agatha Christie! Can you believe it? I just got my first one, and I plan on devouring it this month. Murder on the Orient Express is the only Christie I have read. I was a little underwhelmed, so I think I need to read another of her books to see whether I am a fan of her books or not. I thought Murder on the Orient Express was clever, but I was disappointed that there were no real clues for the murder. I've only read one of her books (just a couple months ago) and enjoyed it. Thanks for the review of this book. It's hard to find the time to do as much reading as I'd like...so your reviews are so helpful! That's what has been missing from my summer, a good Agatha Christie novel. 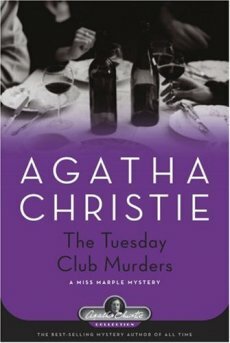 I've read a bunch of her work but not any Miss Marple books--definitely plan on trying The Tuesday Club Murders! Jennifer- You are missing out! Lola- It might be her most well known but it wasn't my favorite. Kathy- You're right, they're weren't. Teena- That's one down, 79 to go. Ok so I've read murder on the orient express what other books should I be reading. Am trying to get off my diet of books about japanese culture and football and TBH some Agatha Christie strikes me as something I could pursue.